What Could Be Sweeter Than Chocolate? In case you didn’t know, Sucre (where we are staying) is the chocolate capital of Bolivia. Of course this made all of us excited…and we had hoped to try the chocolate at some point. Today was that lucky day! 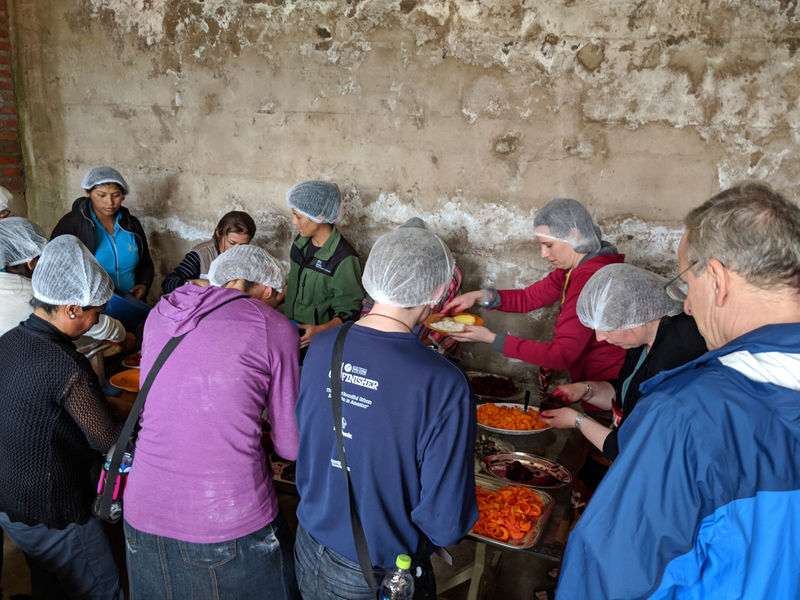 We met the Food for the Hungry staff at the chocolate factory “Para Ti”, but they gave us a treat sweeter than chocolate…they brought along our sponsored children! It was so wonderful to have a special activity with the children and have extra time to spend with them. My own sponsored child is pretty shy, but she lit right up when the chocolate samples came out! This afternoon we were invited to a women’s saving group meeting. While they typically have smaller meetings, this was their first meeting with representatives from all of the local communities. Each small group of women shared information about their own neighborhood group and then a Food for the Hungry staff member facilitated a conversation about what challenges groups may have had and how they have worked through their challenges. Many of the groups have only formed in the last year, but the communities of women have created fairly elaborate systems for saving money as a group. It was so wonderful to hear the women speak about where the group was a year ago, how they work together to save money, how they encourage new women to join them, how their numbers have grown, and how they will eventually be able to spend the money they saved for the year. Their system was impressive, BUT the joy and pride in their faces when they shared what they have accomplished and how it has improved their well-being was what touched me most. In a culture where they may not otherwise find sense of purpose or hope, we witnessed a room full of women who are now in charge of their family finances, are setting and achieving goals, and are creating more hopeful and joyful lives for their families and children. Today was our last trip into Lajastambo, the city which now holds a special place in all our hearts. We will miss the people, the children, and witnessing the way Food For The Hungry has and continues to pour into this community. Food for the Hungry’s vision is to reach the most vulnerable. It was among the most vulnerable of Lajastambo that we found the warmest welcome. We will miss the open arms, easy laughter, and genuine generosity that came so easily to people that have so little. The hardest question we are asked is “When will you come back?”. 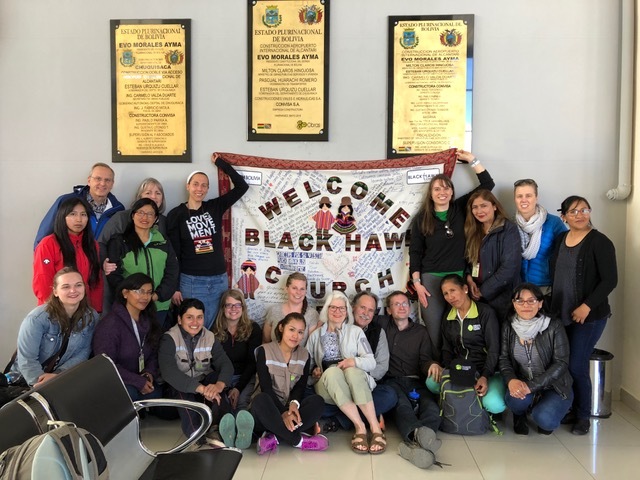 Although it breaks our hearts to hear it, we can confidently assure the people and children that other representatives from Blackhawk will continue to come along side Food for the Hungryand will continue to support, encourage, build relationships and assist with work God has called them to. Wash your hands before you eat and after you go to the bathroom. Kids grow faster and are healthier if they eat healthy foods. Playing with your children helps them learn. These are simple truths, but because Lajastambo is a vulnerable community facing malnutrition, poverty, and a lack of education, FH staff focus on educating children and adults on some of these healthy habits that lead to a higher quality of life. Today our team visited the nutrition/community center built with funds by Blackhawk. 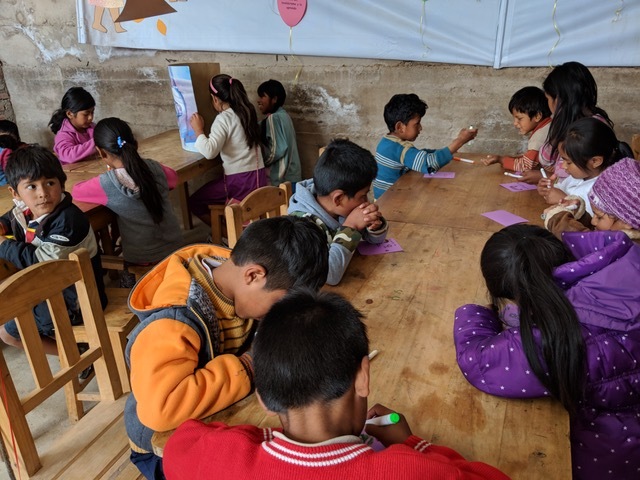 While this building works as a health center focusing on growth charts and consistent check-ups for children, it serves as an education center for their parents and community leaders. One of the great things about FH is that as an organization, it prioritizes creating leaders from within the communities who can then educate their neighbors. We were able to see this first-hand as we helped mothers create toys for their children out of recycled materials. A fishing game made of shoe boxes, cardboard fish, and yarn encouraged children to develop fine motor skills. While these mothers made games, another group of women cooked nutritional food from local ingredients (All the dishes were delicious!). After each group finished, they shared their different activities and how to duplicate them in their own homes. Later in the afternoon, we worked with children and focused on developing good habits. Our team split in two. While one group helped children learn how to brush their teeth properly, the other went to a class focused on recycling. We reused plastic bottles by turning them into pencil cases, learned why a healthy environment is important, and practiced washing our hands before eating a snack. While it would be easy to say FH does good work by helping children develop a proper hand-washing routine, their gospel-centered focus goes so much farther. As our quality of life is defined not only by our physical well-being, but also by our emotional and spiritual wellness, FH staff explain that we want to be healthy because our bodies are gifts and our lives are sacred. Also, by educating adult leaders who can then reach out to their neighbors, FH helps build community that reflects a humble, loving God who serves others! We had the opportunity to experience two different churches in Lajastambo and it was such a great experience. In the morning, we joined Rio Jordan for singing and they welcomed us warmly! Most of the team went back with the kids after singing while Tom gave a sermon using a few phrases in three languages. The church is doing a magnificent job leading the kids and giving kids leadership. They have more kids than adults! We were able to share a quick message from the kids at Blackhawk and the kids at Rio Jordan wrote cards for the kids at Blackhawk. I can’t wait to share them! Such a fun example of the big ‘C’ church. > We then had the opportunity to do a few home visits and hear testimonies of the community. One woman shared how an elder of Rio Jordan prayed for her husband who was bedridden with leg problems and he was healed so they went to church, accepted Christ and has brought four more people to church because of her husband’s transformation. Before Christ, he had a problem with alcohol and doesn’t anymore. The church is growing! > Lajastambo is also growing and has so much life. Kids love Jesus and are bringing their parents to church, just like at Blackhawk. Rio Jordan has beautiful dreams for the community and seeing the kids worship gave me such hope for the future. I’m so glad Food for the Hungry is an active presence in this community. > This evening we went to Congregaciónemanuel and got to see another glimpse of the big “C” church. The Face of God was evident in the faces of the children and all the members. They will be starting a Children’s Ministry soon. They are praying often for us and it was a joy to worship with them tonight. Two of our team members led the workshop while about six team members kept about 30 kids entertained. The couples in attendance were introduced to the five love languages and some communication and conflict-resolution tools. None of the couples had ever heard of the five love languages, so we spent some time helping them discover their love languages. The couples were then split up into a women’s group and men’s group. Separately they wrote down their own love language and words of affirmation for their spouse which they shared with each other after coming back together. 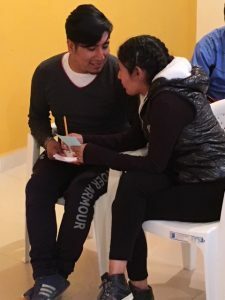 At the end of the workshop, the couples reaffirmed their love for each other in a rededication ceremony led by staff from Food for the Hungry (FH). One FH staff member told us many of these couples had never communicated with each other like this. Our prayer is that these couples would take their new-found communication tools and use them to build strong marriages and flourishing families. This morning our team had the privilege of visiting the gardens and greenhouses of some of the mothers that FH works with. Our team was divided into two groups and each went to a different neighborhood. The neighborhood that my team (Tom, Steve, Dana, Ashley, Ellisa, and myself) visited has been working with the FH staff for just over a year to build their green houses. Many of the greenhouses we saw were just started in December and are already producing vegetables that the women are harvesting! 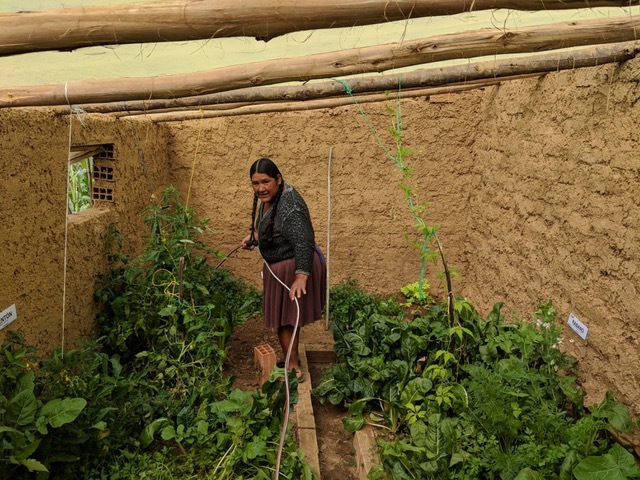 We learned that the families have to build the main structure, windows and door for the greenhouse and then FH provides the materials for the roof and the tank and gutter system to collect rainwater. Having the greenhouse allows the families to have vegetables year round. They also save money because they don’t have to go to the market to buy vegetables. Some of the families have large enough greenhouses that they can sell some of their produce to make a little money. The neighborhood my group was in has hopes of building a large community greenhouse that they can sell the produce from to make the money needed to maintain it and their family greenhouses. All the vegetables that the women grow are organic. They use garlic and onion water to prepare the soil and that keeps the plants protected from insects and fertilize the soil with dried manure. Among the vegetables we saw growing were tomatoes, beats, lettuce, cabbage, carrots, green beans, peppers, and many more. As we were visiting each garden it was very apparent how proud these women are of their greenhouses and gardens: and they should be! These gardens are amazing and the women work hard to create and maintain them. I was glad that we were able to see the work they do and tell them how wonderful their work is. During our visit we attracted a small group of children who very quickly got past being shy around us! We had a lot of fun playing with them. A few of our group were racing them up and down the road even! At the end of our visit we were invited into the yard of one of the homes and given a delicious veggie patty made from vegetables grown in the greenhouses! It was so kind and generous of the families to share their food with us and I am truly grateful to them. From talking with the second group it sounds like the neighborhood they visited was just starting to put in greenhouses and they were able to help plant tomatoes in one of the gardens. Overall visiting the gardens was a wonderful and very educational experience. This was a perfect picture of the work FH is doing in Lajastambo to create a sustainable system of nutrition. Today, we, and especially myself, were reminded what living in community is really about. Starting the day building relationships with the FH staff, who welcomed all of us by first learning each others names through a game of throwing a ball of yarn around. We also got to learn about each of the communities that FH is working with here in Sucre, as well as the visions and values that we are partnering with them in, which starts with a biblical worldview of what it means to see all of the people and children we get to play with, meet, get to know who they are, and more, and in many ways there’s often not a better way to do that than to prepare / cook / and share a meal with, which is exactly what we did after getting together at the main FH building. Personally, getting to know the different women while helping them cook and prepare our lunch by making fruit and marshmallow kebabs, cutting a very large pot of carrots and beets, making meat balls, and cutting many other vegetables was a great experience to just know who they are, hear their stories, have them show us the different ways they cook (which was much faster than many of us from the US), as well as being able to share photos and stories of our own lives and families. But it was in many of these moments that I began to realize what community is truly like, as well as what a blessing and joy it is to put all of the worries and cares of the "logistics" of something behind, and to just be in the moment with each other united in Christ. It was also a blessing to again see just how big God’s community really is throughout the world as we all struggled and worked at the language barrier, but, I think, that even with that, I often found that the Holy Spirit spoke in us the words we needed to hear or say. 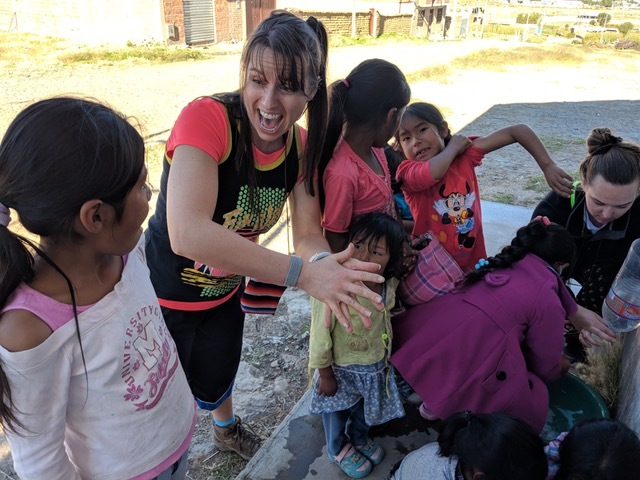 Often many people who go on mission trips go down with the intention of "doing something" but it is so often that the reverse happens in which we are the ones being ministered to as long as we let others do so. Another part of community that we got to be a part of is the community that FH is working to build and cultivate with all of the children in building relationships with the whole families through the children. 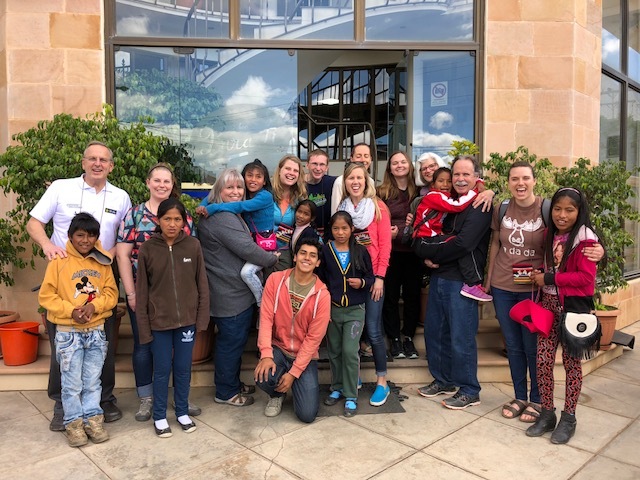 Many of the members of our team got to meet the children they sponsored face to face, all the while getting to share with each of the families who they are, while also getting to know who they are. Through all of the events today, getting to build relationships of every kind has just been an awesome highlight of this trip, and it’s only been the second full day! 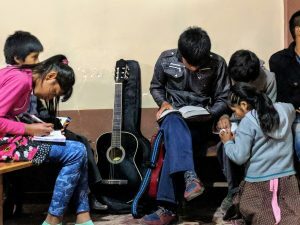 As we’ve been going through our series of "Beyond Measure", including for what is "Beyond Me", seeing what is beyond us in the relationships we can form, the people in whatever situation we may find them in and just stopping to pray with them, and to be a part of what God is doing here in Bolivia, doing everything with Thanksgiving. 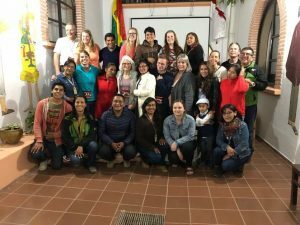 There are so many more things that we’ll get to participate in the coming days, and I look forward to every moment shared with others on our team, and with the many Bolivianos both young and old. What a welcome in Sucre! After a long bout of traveling, today we arrived in Sucre. At the airport we were greeted by Food for the Hungry staff as well as the children from Lajastambo. What an amazing welcome. 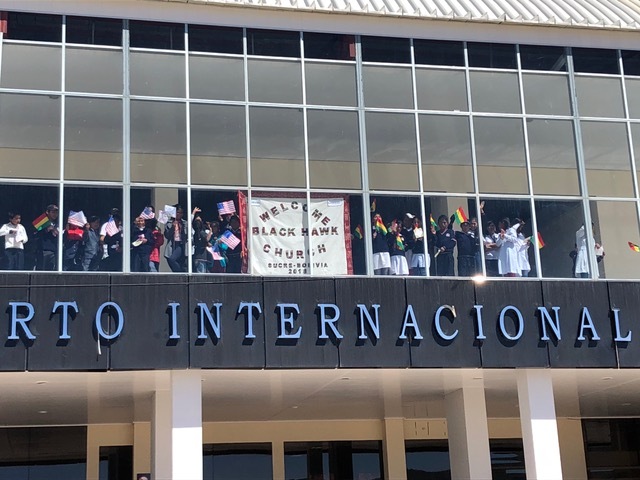 The children all had smiles on their face and flags waving, along with a giant banner welcoming Blackhawk Church. We were able to spend some time meeting and greeting and getting excited for what is to come this week. How awesome! After that, Abi, our Food for the Hingry liaison took us to the hotel we are staying and also talked a bit more about Bolivia. Later, Abi took us to a downtown area with a market where we shopped for supplies for some of the families that various Blackhawk members are sponsoring. We got to see the market and many traditional Bolivian food and supplies. I can’t wait for tomorrow where we will get to see Lajastambo, the area where the children live. Thank you all for following our journey.